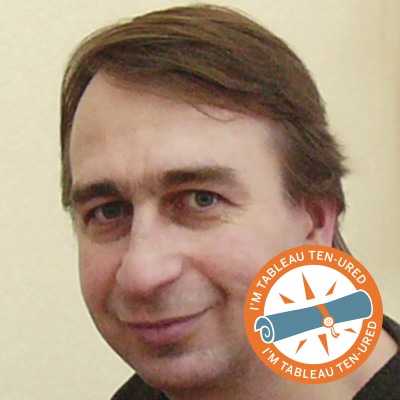 Meet our Tableau TEN-ured community members! There's something special about the number ten. Sure, it's only got one more digit than nine, but that digit makes a world of difference. 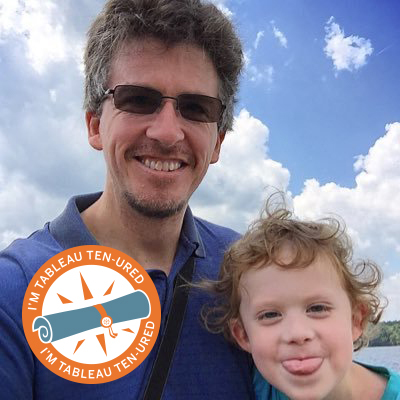 Tableau 10 is big! It's an exciting milestone for us, and we couldn't have gotten there without you, our incredible community. 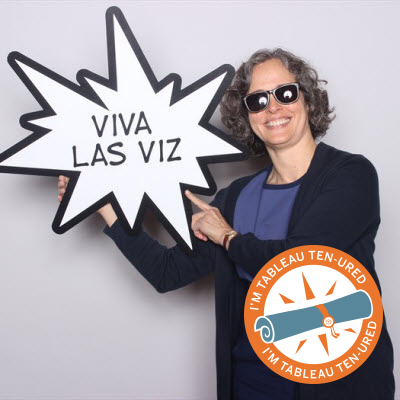 To celebrate, we’d like to highlight some of the important milestones that are happening all around the Tableau community. 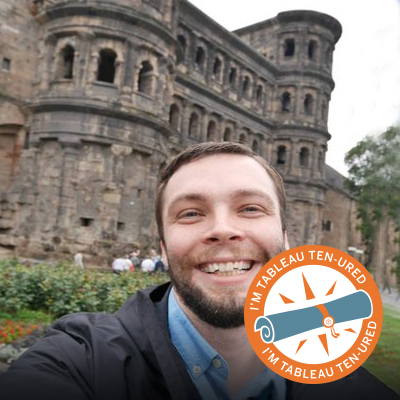 We chatted with 16 community members who are each celebrating an important milestone in his or her Tableau journey. 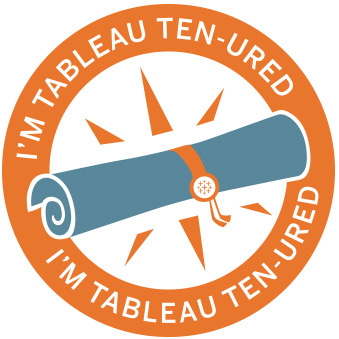 They are, as we like to say, Tableau TEN-ured! And we’re excited to share their stories. Sean works in the population-health space for one of the largest healthcare IT companies in the world. 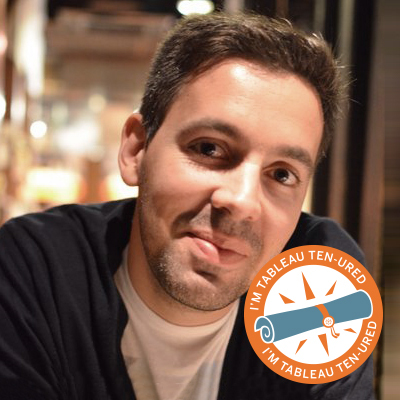 By day, he’s a Tableau Desktop analyst and by night, he builds Tableau Public vizzes. Susan is a program manager and volunteer coordinator for FIRST Washington, an organization dedicated to inspiring future technology leaders. She enjoys managing the FIRST LEGO Leagues, and is excited to see her organization become more data-driven. 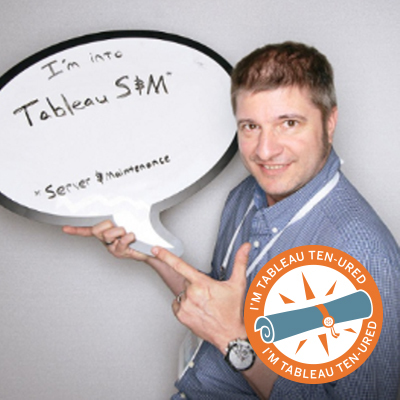 A principal consultant at CACI, David discovered Tableau a couple of years ago and recently became a Tableau Social Ambassador. Now living in London, David misses the sun and food of Portugal, his home. 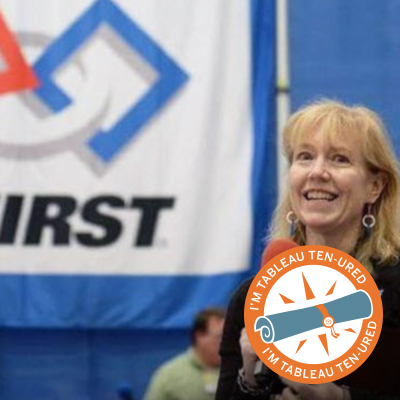 Fiona (Fi) Gordon is a newly-appointed Tableau Social Ambassador. A passionate mentor, trainer, and blogger, Fi has more than 15 years of experience in the data industry. She currently manages an enterprise business-intelligence team. Adam is an active blogger and mountain biker living in upstate New York. 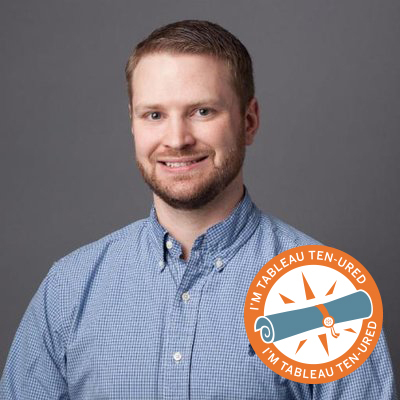 Recently named a Tableau Social Ambassador, he enjoys visualizing just about any data set to try out new techniques and tricks. With a degree in English literature, Andrew works in the healthcare industry as a systems analyst and Tableau “vizard.” Both an artist and a data analyst, he enjoys traveling, playing music, and writing. 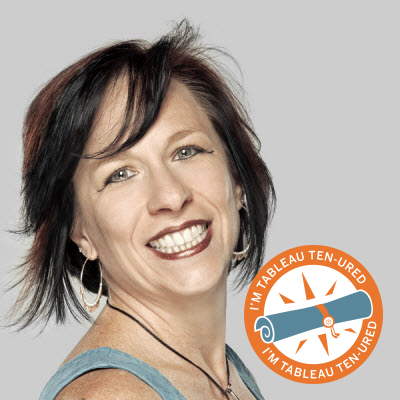 In 2011, Cathy reverse-engineered her first Tableau workbook and has been hooked ever since. 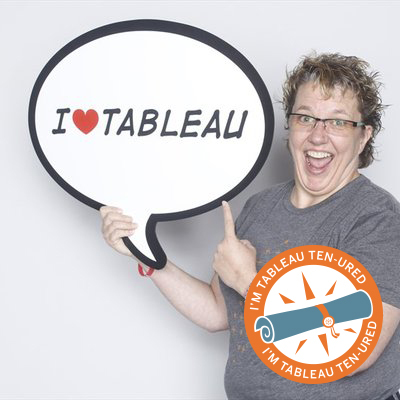 These days, she beta-tests and contributes to both the Tableau and Alteryx communities. Russell has been using Tableau for over six years and is known for his food-related Tableau Public creations. 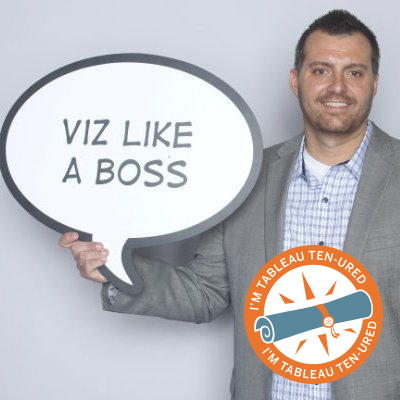 This year, he’ll be competing in the Iron Viz Championship at Tableau Conference. 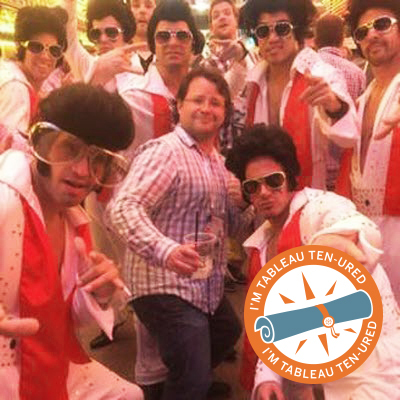 Toby began his career in the early days of business intelligence and now works as a Tableau Server admin. A Tableau Community Ambassador, he enjoys restoring classic Volkswagens in his free time. Michael manages a small team of analysts for the sales-operations team at Seagate Technology. Outside of work, he’s a father of three, an amateur photographer, and a frequent contributor to Makeover Monday. Yuri got immersed in computers from the early days of the internet, and started exploring data viz in 2007. 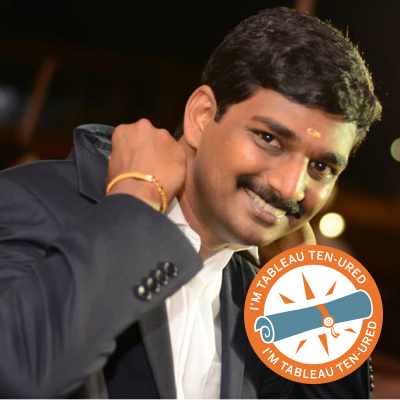 Recently named a Tableau Community Ambassador, Yuri works at ANALYTIKA PLUS. Founder of trinalytics, Trina is passionate about integrating data from a variety of sources to fully understand a client’s business. 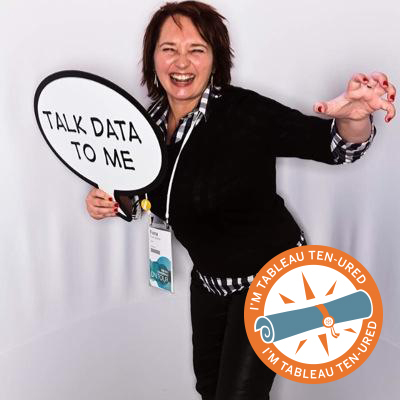 Her favorite Tableau 10 feature is cross-database joins, and she’s constantly on the search for new data sources. 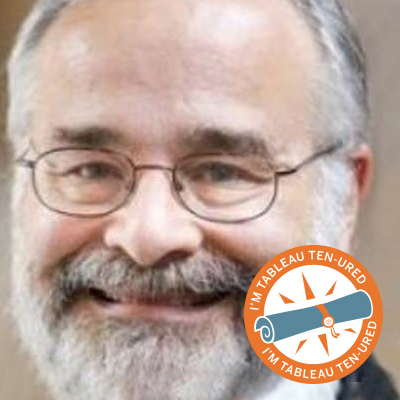 Michael is a managing consultant at the Lewin Group, where he coaches a talented team of Tableau specialists in health and human services. He is passionate about using data visualizations to better understand the world. Arun is the co-founder of Cookie Analytix. 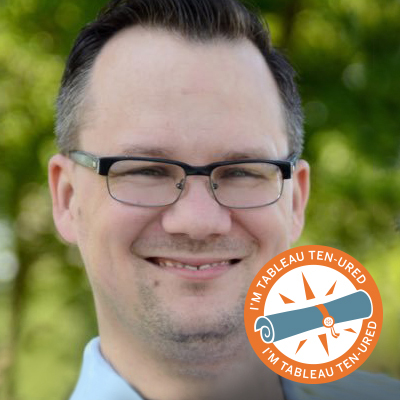 With almost a decade of experience in Tableau, he’s handled multiple projects to help clients make better use of their data. As a scientist working in the genomics space, Katherine first came across Tableau while looking for a powerful data-viz tool. Now, over a decade later, she is still having fun visualizing data.